Heading into the Northern Pass this year, expectations were set high by the inaugural evet. But lesson learned, never doubt. The second year had it all. From twice as many riders raising more than twice the funds for cancer research, to mid twenty degrees with low winds, all topped off with a spontaneous bike auction being live streamed on Canadian Cycling. While the lead group on the 160 km course around Lakes Muskoka and Rosseau set a blistering pace, everyone has their own experience. In 2017 I rode the 3 lake course, and although left feeling accomplished, the overall day felt disconnected. So this year, Mike of Blacksmith Cycle and I, as members of the organizing board, decided it was better to do the shorter 107km route so we could be more present with the main group, and to be there for the long distance riders when they returned. It proved to be a great decision. The 107kms and 1250m of climbing still provided more than enough challenge and being there in the celebrations at the finish line meant a lot. But what truly makes the Northern Pass ride so amazing? The people, of course. Seeing their pent up anticipation during the opening ceremonies, their smiles out on the course, and hearing all the stories being retold makes all the work so rewarding. The very best part? Northern Pass keeps me connected to the community all year long. As part of the 2017 event prizes, I provided a photo shoot package to help encourage and reward the fund raisers. The winner of the draw was given their choice of either a half day ride along or a studio photoshoot of their bike. The eventual winner was Laura (Robins) Peever, and despite some delays, we finally got out to photograph her and her husband on the road. I'll be honest that photographing people isn't really my favourite thing, I’m more a landscape and studio pro, but the right people can make all the difference… Meet the Peevers. Laura and her husband Scott are two people doing what they love, with the people they love. Both Laura and Scott are members of the same local cycling club here in Toronto, the Dark Horse Flyers. 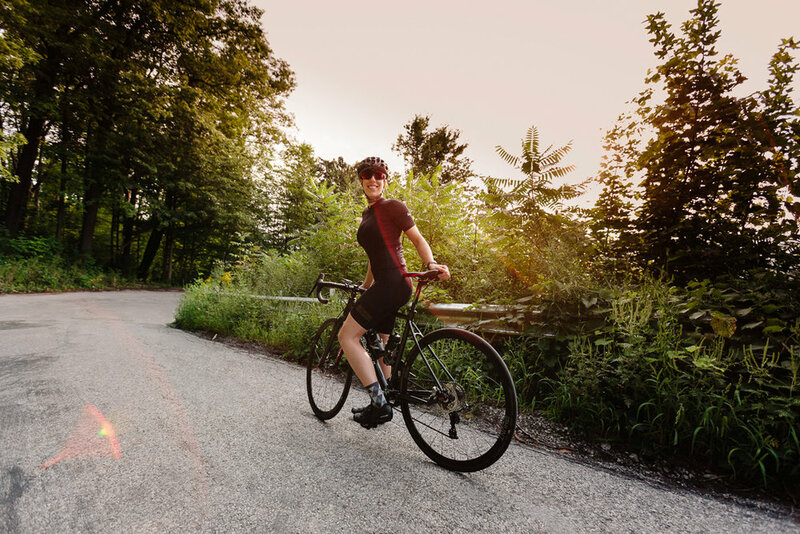 But don’t fret, their strong cycling prowess wasn't just earned on local loops, Laura has cycled across the second largest country in the world, Canada. Going coast to coast started by dipping a rear wheel in the Pacific coast off Vancouver, Laura then rode ~130km/day over 62 days before finishing by dipping her front wheel in the Atlantic ocean off St. John's, Newfoundland - with Scott joining in along the way. That's more than 8,000 of riding. And when they aren't doing something dramatic on the bike, they seem to be doing it in the mountains. Laura and Scott were recently married after getting engaged on the side of an Alaskan mountain. So what do you do to capture the passion of two adventurous people? You make them ride up and down what Canadian Cycling calls, "the nastiest" of the climbs in Ontario. Before dawn on a steamy summer morning, I took the pair out to some of the country roads along the Niagara Escarpment. These are the roads I used to ride as a teenager. It's reassuring to see the steep and twisty forested roads still pass muster (although could use a repave in some sections). We started out with some warm up laps in the rolling hills atop the the plateau to open up the legs and to get them comfortable in front of me and the camera. 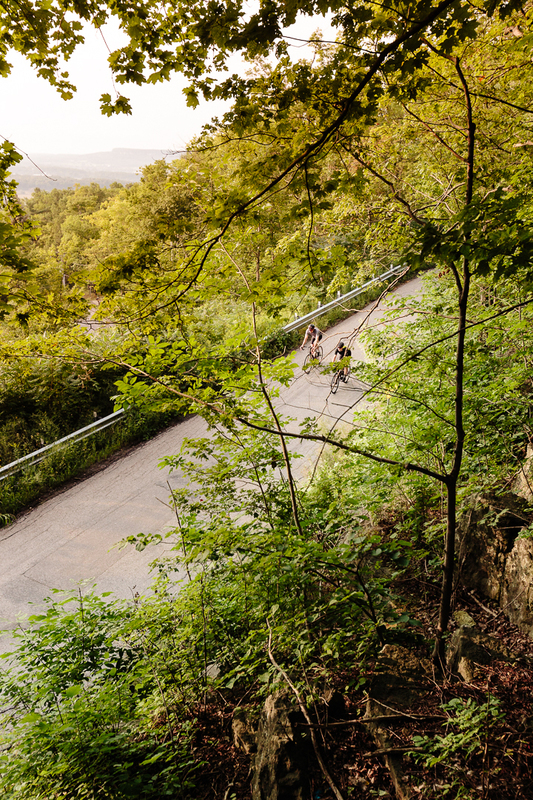 As the sun began to rise and light up the overcast sky, we headed to more open and twisting roads before we settled in for a session on Rattlesnake Point. The 1.2km long climb rises only 100m but at an average of 8.5%. On paper it doesn’t seem intimidating but much of the action is concentrated in a set of hairpins that offer no respite with their 16 degrees of incline. What I like most about this location is that it is iconic to the area and provides opportunity for interesting angles down low or from up high. To end the session we ducked over to Sideroad 3 which twists and dips through thick forest cover. 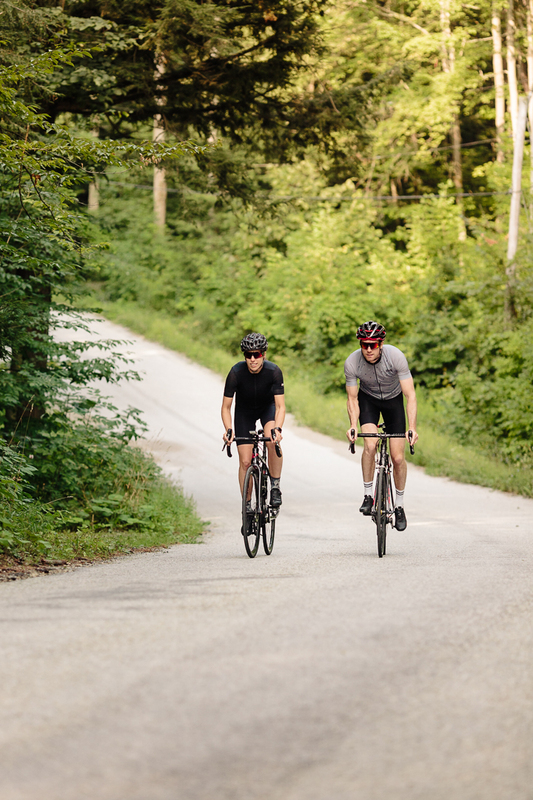 As another popular local section, Sideroad 3 well represents the best type of riding outside the city. During a quick break we stumbled upon a forest trail that was a bit of a stretch for Scott's Cannondale Super Six but perfect for Laura's Van Dessel A.D.D. - which she also won at Northern Pass 2017. “After a restless night and a 5am wakeup, we met Jeremy at the Tim Hortons just off the 401 for 6am sharp. Since it was too foggy to catch the sunrise, we grabbed a quick coffee (it was no Dark Horse! ), loaded the bikes onto his roof rack and hit the road. Exhaustion turned to anticipation as we parked at our first location along a picturesque side road in Milton. ‘With all the “couples shots’ we’ve taken recently (we just got married in February), we were keen to do something a little different - photographs that would celebrate our love of cycling and the beautiful Ontario scenery so close to home. Fortunately, Milton is Jeremy’s childhood backyard so he knew all the best spots to shoot throughout the morning. For several hours, Jeremy made us feel like pro cyclists shooting for the latest magazine spread. We now have a new appreciation for how hard photographers work for those few killer shots, including bouldering up cliffs with expensive camera equipment, and running around in the middle of the road dodging cars. Although we only did 20km of riding, it was mostly hill repeats (including a section of the famous Rattle Snake climb) and by the end of the shoot we were wiped. In true cycling fashion, we wrapped our ride with a hearty breakfast at a local coffee shop - the highlight of any good day in the saddle - and learned the valuable lesson that no one looks good chewing in photos. While Jeremy is a killer photographer, being an avid, long-time cyclist gives his photographs an additional level of depth. He truly gets the technique and helped to coach us on positioning and angles to get the best possible shots. In the end, we had an absolute blast and were thrilled to see this translated to the photos. We both just love riding, especially together, and it is really special for us to have this feeling captured forever in such a beautiful way. " I don't do a lot people photography anymore but being able to work with people like Laura and Scott sure do make me want to do it again.